Recently there is an article going viral on the net about a woman who paid photoshoppers from a handful of countries around the world to change her into their culture’s view of beauty (some horrible photoshopping aside, it was a good idea). I was waiting for the “Japan” version and I imagined how it would look like: rounder face, filled-in cheekbones, more defined eyelids, slight duck lips, extra large irises, fake lashes, and a wavy shoulder-length hairstyle in a light brown with orange-ish tones. #1 was said to my close Asian-American friend in LA when trying out for modeling and movie parts that called for Asian girls. 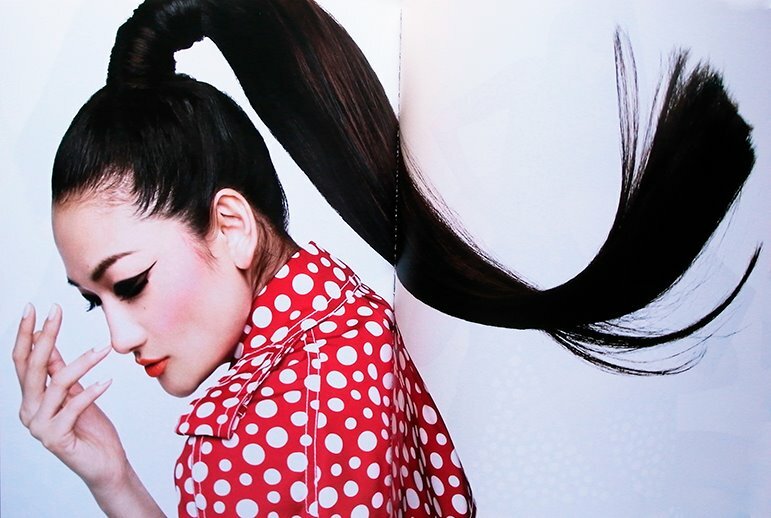 #2 was when she moved to Japan to model as an Asian. I had shown her this article before I posted it to get her opinion and she shared with me the above experience. I was floored that it was still so stereotypical. There is no doubt about it, when the western world thinks of Japanese beauties, they think of a common look: a “Yamato-nadeshiko”-like. [Yamato-nadeshiko is the term applied to Japanese women who behave traditionally in society, and also refers to a “traditional” look.] That means shiny black hair and stereotypical “asian” facial features like almond slivers for eyes and sharp cheekbones. This is because these features are more rare in Western countries, and rareity is a virtue of beauty. It’s all too true in the fashion world too, even though it really should be a celebration of unique looks all around. Going on terms of those who have caught the attention of western fashion media, mainly girls like models Sayoko Yamaguchi, Ai Tominaga, Tao, Rila Fukushima and actress Rinko Kikuchi come to mind. They are seriously beautiful women, but they have found far more success abroad than in Japan. That’s because the expectation of beauty is so different across the oceans. No Japanese person would deny their looks, but it’s usually only after they become popular abroad does the local media really turn their attention to them. Why is it that these women enrapture audiences in Hollywood and beyond, but mega uber local superstars like Ayumi Hamasaki cannot break into the market, despite looking like the immaculate local ideal? The same goes for those who embody “ideal” aesthetics of other Asian countries, Angelababy from China and Girls Generation from Korea? It just hasn’t happened yet. What about the VOGUE question? Ever since VOGUE Japan launched in 1999, every single fashion magazine fan in the western world has asked the same question at least once…. Many westerners may confuse VOGUE cover models with what Japanese consider to be their own ideal in looks. In fact, this has nothing to do with it. VOGUE Japan simply is a magazine that represents what is popular in fashion in the western world, and that doesn’t preclude the biggest names in modeling there. There is no push within it’s pages that Japanese models aren’t good enough or to look more western. There are other fashion magazines here that cover the local scenes and local models/celebrities instead. It goes both ways however, like when local magazines feature really “hot” celebrities in Hollywood that don’t really fit the beauty mold locally. An actor or actress may be all the rage abroad, but they will barely make a ripple here if they don’t sport certain features (Proof is when Japanese mags twitter gossip and certain celebs from abroad and get absolutely NO retweets/social shares vs those who fit a more local ideal of beauty/cuteness and get an avalanche of shares). Can perceptions of beauty be globalized? I have been asked to be an image consultant in the past for budding young entertainers in Japan, and I get asked, “What features do you expect to see in a Japanese girl from a western standpoint? Which Japanese celebrities do think are beautiful?”. That’s just how different our cultures divide. Despite the globalization of fashion, pop culture and celebrity-dom, I think that we often forget that popularity cannot be judged on beauty when it comes to selling across cultures. And what is considered a local ideal may be very far off from how the rest of the world expects that local ideal to be. This concept is called “localization” and it’s another topic for another day. Hi misha! What about kiko mizuhara? She doesn’t have big eyes and more like “asian”.